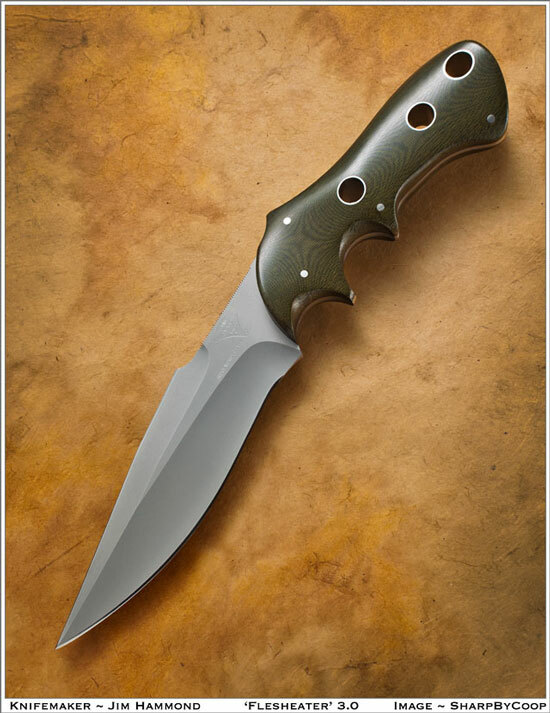 The Flesheater 3.0™ -- Overwatch™ is the second spin-off design from the original Flesheater in the Flesheater Design Group, filling the niche as an excellent 24/7 personal utility fixed blade as well as a personal protection hide-out knife. The blade incorporates a main lower blade grind with a thinner swedge grind along the top front half of the blade. Bearing many of the same key design elements as the two larger Flesheaters, the Flesheater 3 provides the smallest handle size possible while maintaining an outstanding blade to handle ratio for optimal balance and performance. Utilizing a thinner handle profile and a 3/16” thick blade, the sleek efficient shape fits the hand like a glove, providing maximum control in all applications. Full serrations down the flat aft of the Navarro Hook™ on the blade back provide secure thumb stability for hands of all size in the fencer’s grip, when used in lieu of the standard Flesheater grip. 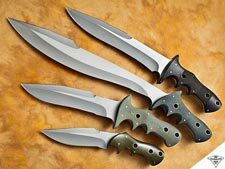 Flesheater 3.1 (not shown) is a spin-off variation of the original Flesheater 3.0, having the same handle configuration but with an offset double-edged dagger blade. Flesheater 3.2 (not shown) is the second spin-off variation of the original Flesheater 3.0, having the same handle configuration but with a single-edge utility blade. The kydex sheath is configured for ease of personal carry in various configurations. Refer to the ‘Sheaths’ website page for additional details and options.